♦ Extra-thick heat-resistant handle for safe, comfortable use . friends search for the barista you must have hidden in your kitchen . but will give you perfect foam every time. ♦ Two size options: . 14 oz. for personal use and 20 oz for 2-3 person . ♦ 100% Lifetime Satisfaction Guarantee for risk-free shopping . ♦We're confident you'll love our milk frothing pitcher . ♦ if you're not completely satisfied, we'll give you a 100% refund within 90 days of purchase. ♦ As the lighting effects, the color of objects maybe a little different from pictures. ♦ Please allow 1-5mm error due to manual measurement. please make sure you do not mind before you bid. 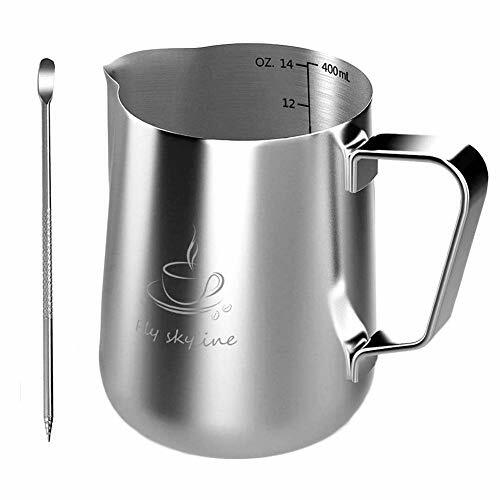 ★PREMIUM QUALITY & HIGH CAPACITY: This Coffee Milk Frothing Cup is made of high grade stainless steel, never stains or rusts.high capacity that makes the milk pitcher perfect for 2 or 3 cup, a size for a family, the mug to light up a new day! With heat-resistant and carefully-polished handle, the frothing pitcher cup is much safer and more comfortable to use. ★LIFETIME GUARANTEE: We want you to enjoy using the Coffee Steaming Pitcher every day and that is easily the best milk frothing pitcher you've ever used. As such, it comes with a lifetime guarantee for 100% satisfaction. If you have any questions about this product by Fly Skyline, contact us by completing and submitting the form below. If you are looking for a specif part number, please include it with your message.